This recipe is written for use with a Belgian waffle maker. If you use a regular waffle maker, use the amount of batter recommended in the manufacturer's instructions. Adjust to more or less batter as needed. Place the cream cheese and eggs in a large bowl. Beat together with an electric mixer at medium speed until well combined. Add the lemon juice and vanilla extract; mix again briefly to combine. Add the sugar, flour and salt. Beat again until combined, about 2 minutes. Let the cheesecake batter rest while your Belgian waffle iron preheats. Coat the hot waffle irons with cooking spray (I used olive oil spray because it's what I had on hand, but a neutral-tasting oil like canola is an even better choice). Pour 1 cup of batter onto the irons and close the waffle maker lid. Let cook until the mixture stops steaming and the indicator light (or timer) indicates the waffle is done. Open the lid and remove the waffle with a fork. The cheesecake will be tender, so you may have to remove the waffle a quarter at a time. Top warm waffled cheesecake with powdered sugar and your choice of toppings. I suggest any of these: salted caramel sauce, lemon curd, chocolate syrup, whipped cream, fresh strawberries. Everything about this is perfection. SO yummy!! What. Glorious. Wizardry. Did. You. Just. Achieve?!?!?! Very original and incredibly delicious, I'm sure. This is so incredibly unique, I can't even imagine what it'd taste like?! Love your creativity and I can't wait to try this. Pinned this recipe! Genius! I would have eaten the failed recipe too! Should I still spray my iron with cooking spray even if I don't typically do so for normal waffles? I would suggest using the spray. It's extra insurance that the batter won't stick. 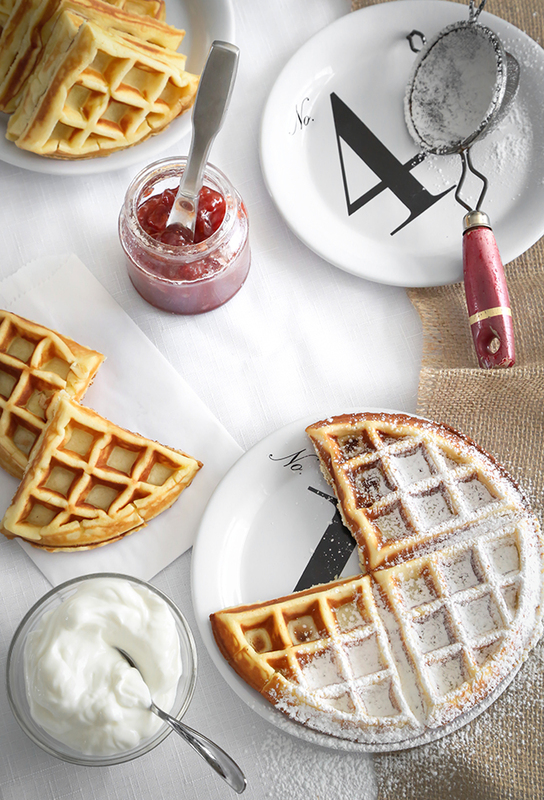 Since the mixture is predominately cream cheese, it could be more prone to stick than other waffle batters. I love that you dedicated so much effort into making it possible to cook cheesecake in a waffle iron. If I needed motivation to work on in order to eat whatever I want, here it is. I may need a couple extra hours to prepare. These look mouth waveringly delicious! 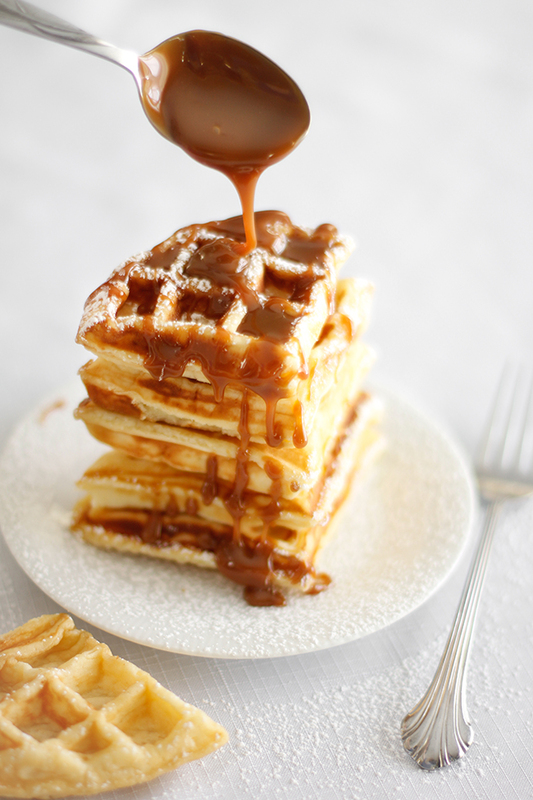 I can't wait to make this recipe, now I have an excuse to unpack my waffle iron. I'm dying over this, Heather! And the steam coming up up from the waffle iron is kind of amazing. Whoa. This is like, a legit milestone of baking. Waffled cheesecake?!!! You seriously broke some sort of glass ceiling of cheesecake with this recipe! So impressed!!! Do you think I could make the batter the night before, and just remix right before waffling? What an interesting idea! I never would have thought to do that. I think the mixture should be mixed just before it goes into the waffle iron. I feel like the cream cheese would solidify overnight in the refriterator, and the mixture wouldn't be pourable, even after whipping. You could measure out all the ingredients and have them ready to hand for mixing (mise en place). The batter just takes a few minutes to throw together, provided the cream cheese and eggs are already at room temp (it's okay to set them out overnight) so there's not a lot of work or time that goes into it. I've seen frozen cheesecake and frozen waffles, so hoping you think these are freezable? (Because my kids would love these for breakfast but there's no time on a school morning.) TY! You're a dang genius. That is all. after reading this write-up, i am sitting here speechless and hungry. Say WHAT!? This is like, the most awesome thing I have ever seen. Cheesecake+waffles=a dream. This is so yummy. Waffle Cheescake is jsut so perfect. The salted caramel sauce and powdered sugar mad it even better! Waffled cheesecake wooow so cool hates off for you,Thanks for sharing this post. This was breakfast this morning. Super easy, and delicious. I subbed in gf flour and xanthan gum, and used my 4inch waffle maker. (Great texture, and no sticking!) Plus strawberries and whipped cream, if course!